This shareware package offers advanced support for USB Human Interface Devices (HID) under RISC OS. It consists of a number of low-level RISC OS modules and offers support for enhanced keyboards, wheel mice, barcode scanners, joysticks, touch screens, etc. In addition, the HID-application allows easy configuration of special keys and installation of the underlying modules. Most special keys will already have a name as provided by the USB Forum and any action can be linked to it, such as launching an application, executing a *-command or calling a URL. If you have multiple keyboards connected, an action may even be linked to that particular keyboard. The GUI keys (also known as the Windows or Logo keys) can now be used as a modifier, in the same ways as the Control, Shift and Alt keys. 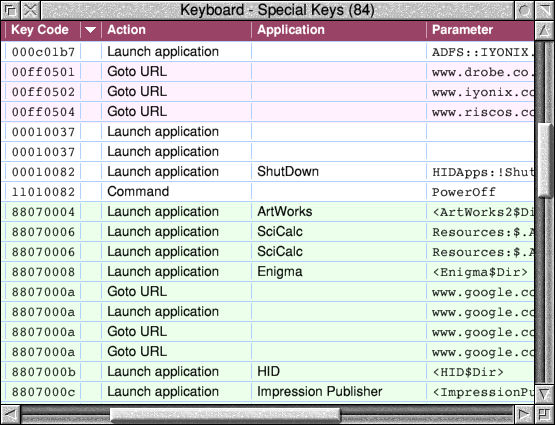 This provides new key combinations that can be particularly useful for launching your favorite applications or executing background tasks. USBHID fully supports the Apple aluminium keyboard and maps the functions of the extra function keys F13, F14 and F15 to Print, ScrollLock and Break, so that it can be used as a normal keyboard. This means that Control-Break (or actually Control-F15) can be used to reset the machine in the usual manner. USBHID offers full support of the scroll wheel that is present on a modern mouse. It allows you to smoothly scroll the window that is currently under the pointer. As RISC OS has no native support for this, HID offers a variety of scroll methods, that can be tailored for each individual application. USBHID fully support the Apple Magic Mouse, that can scroll in two directions and offers five mouse buttons. On RISC OS it can be used to scroll a window both horizontally and vertically, and the additional mouse buttons can be configured freely. Although not many people will use their RISC OS computer for playing games, it may still be useful to be able to connect and use one or more joysticks. HID fully supports most commercially available analogue or digital joysticks, with up to 16 additional buttons and extra controls. 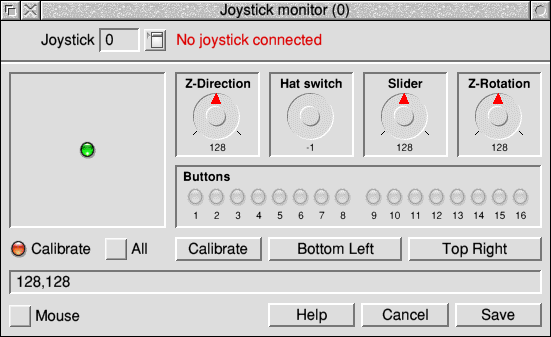 USBHID now offers support for touch screen devices, but this support is currently limited to emulation of mouse controls. Fully support for (multi) touch devices is under development. This is the current release that includes all modules. It is available as Shareware, which means that you can use it freely, but that a financial contribution is appreciated. Registering gives you the right to e-mail support and some extra features. This is our universal configuration utility that is used by !USBinfo. It is only of use if you want to alter the default settings of the application. !ConfiX should be placed in the !Boot.Resources directory of your computer. AltKeys is part of the !HID distribution. It's a tool for entering special characters and accents in a foreign language. It's available as freeware elsewhere on this website.